We continually strive to create and provide the best services and products available for the storage, collection and recycling of your containers. At the core of our service program is our “Clean Cart System”. Every recycling cart we remove is replaced with a clean cart that has been hot pressure washed and deodorized. All of our carts are cleaned without the use of chemicals and are refreshed with our environmentally friendly odor reducing enzyme. The early development of our “Clean Cart System” established ABD as the industry leader in the commercial collection of beverage containers. With over 10 years of experience ABD has refined the systems that will help you and your staff maximize your refundable container recovery and rebate. 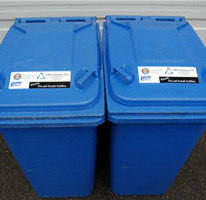 ABD provides the cleanest and most efficient systems available for your mixed container recycling needs. Customers will enjoy all the benefits of our refundable service program at a cost that won’t break the bank. Ask one of our Account Managers how you can start diverting your mixed containers today.